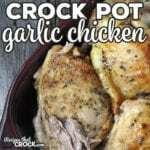 This Crock Pot Garlic Chicken Thighs recipe is super simple. Yet, the flavor and tenderness of the chicken can’t be beat! Melt 2 tablespoons of butter in a skillet over medium/high heat. Brown all of your chicken thighs, about 3 minutes on each side. Place your browned chicken thighs in a 6-quart crock pot, pouring the remaining butter/cooking juices over top. Whisk together your melted butter and spices and immediately pour evenly over your chicken. If you would like to brown up your chicken, place the thighs on a cookie sheet with a large, wide, slotted spoon and place in your oven on broil (Hi if you have the option of Hi/Lo) for 60-90 seconds, watching it closely. When you are browning your chicken, let it be for the 3 minutes on each side. Don’t bother it at all. It will make the browning process work much better. If you choose to use your broiler to brown up your chicken, do NOT walk away. Your broiler can take a recipe from perfection to ruined in the blink of an eye. This recipe makes a bunch of chicken, so it would be perfect for taking to a pitch-in or potluck. However, if you want fewer portions, you can easily cut this recipe in half.